I wanted to share some exciting news with my blog followers, I was just nominated for a Reader’s Choice Award (see below) – By the way if you get Pen World Magazine please vote for me! Established in 1994, the Readers’ Choice Awards is the only international awards program for the pen industry and is based on the votes of PEN WORLD readers. A panel of long-time PEN WORLD readers served as judges, carefully selecting the nominees from a long list of pens featured in the magazine during 2017. There are twelve different categories of recognition and five nominees within each category. Readers cast their votes from the official ballot in the April 2018 issue of PEN WORLD, which was shipped recently. Voting continues through June 15, 2018. Winners will be notified in July and will be featured in the August issue of PW. The awards will be presented at the Washington D.C. Fountain Pen SuperShow, August 2-5, 2018 and the San Francisco International Pen Show, August 24-26, 2018 or as determined by the winner. 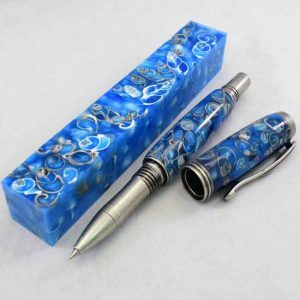 Pen Makers are artists, craftsmen, innovators, and even historians. It is a privilege for PEN WORLD to applaud their accomplishments through the Readers’ Choice Awards. Congratulations and good luck! Barry is in “Pen World” Magazine! Free Rogue Sr. Cigar Holder Tutorial Announcing Our FIRST Arizona Silhouette Pen Contest!